Welcome to Atlantic Canada's first Cat Lounge! 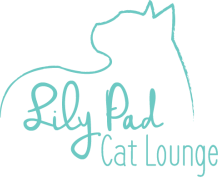 The Lily Pad Cat Lounge aims to offer a calm and relaxing environment for humans and felines to interact. We hope to be able to offer a fun alternative for adoption and to be a resource for rescues. Felines can have a therapeutic effect on people and can turn a long, stressful day or week into a good one (at least for a little while). Whether it be their purr, petting them, or seeing them play, interacting with a cat should help lighten your day! ﻿Have a small event you'd like to host, such as a birthday get-together or work gathering? Get in touch with us. Please not that we may not be able to accommodate larger groups during the quieter time of year. All cats found at the Lily Pad Cat Lounge arrive to us being available for adoption. We have partnered with the Nova Scotia SPCA to offer an alternative way for kitties to meet their potential adopter. ​We also carry a small range of pet supplies, mostly aimed towards cats such a foods, toys, treats, grooming products, etc. We also carry a fun array of cat-themed merchandise for all of the humans to enjoy. ​Please note that we only allow limited amounts of people in at any given time. Reservations or calling ahead are generally recommended, but walk-ins are accommodated when space allows.